Inspiring Ideas with artist Jeanne Winters: Anniversary Sweets! Happy 15th Anniversary to me and my sweetie! 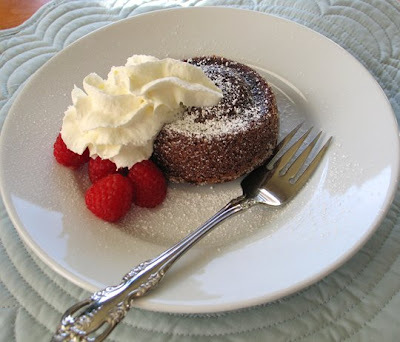 :-) Molten Chocolate Cakes from an old Martha magazine. Deeeeeeeeeeeelish!!! Oh neat! Thank you for sharing this. I LOVE sweets!!! HAPPY ANNIVERSARY to you and your sweetie! GOD BLESS YOU WITH MORE ANNIVERSARIES TO COME! You are a wonderful blessing to me, my friend. iLoveYou, my co-heiress in CHRIST! Happy Anniversary to you!! :) This dessert looks fantastic! May God bless your love for each other today! Yummy! Enjoy your time in CA. Gracious - those do look good! Happy Anniversary!